The company will participate in as many as 12 wells this year, including three that are in various stages of completion now. 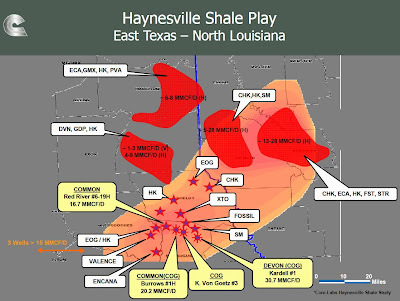 The CEO stated, "Cabot's acreage seems to be positioned in a second core area for the Haynesville Shale." Second core - not exactly "home run" talk but still pretty good. I look forward to seeing the rate for the well that Cabot reports to the state. The King well is located on the second map below. The first map shows where it is relative to a bigger picture. Also note the Walters #1H, a Cabot well that was recently permitted and is spudding this month. 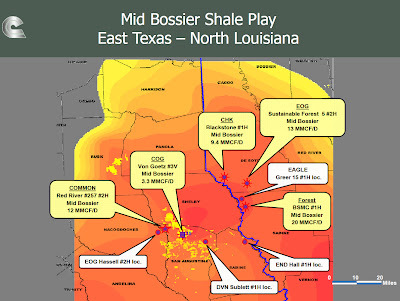 In a presentation yesterday, Cabot also gave its take on the Mid-Bossier Shale. 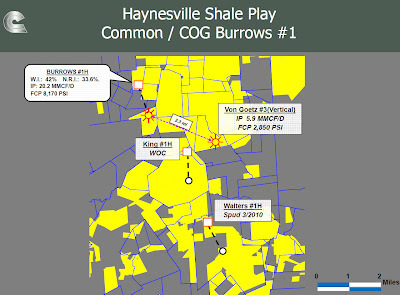 Cabot has lots of acreage in the northern part of San Augustine Co., TX that might be prospective for both the Haynesville and the Mid-Bossier plays.